ENDA KENNY HAS described marathon talks on a third Greek bailout as “bruising” after a deal was clinched early this morning. Eurozone leaders reached “unanimous” agreement on a platform to negotiate a third bailout for the debt-stricken country after some 17 hours of talks yesterday and early this morning. The left-wing government of Alexis Tsipras has agreed to undertake a programme of reforms that will involve passing a number of laws through parliament this week. Speaking at the conclusion of the emergency summit, a tired-looking Taoiseach told reporters: “I’m glad that a deal has been reached here. This has been a pretty bruising experience over the last period. But what this allows for is a document that is agreed now that will be the basis for negotiation for a third bailout for Greece, which will allow the Greek economy to thrive and prosper and continue to remain a member of the eurozone. As well as needing the approval of Greek legislators, the deal will also have to be rubber-stamped by parliaments in Finland and Germany among others, Kenny said. What’s in this for Greece is the potential to grow their own economy to bring it back to a point of stability where growth investment and jobs can be created and to remain a member of the eurozone, which was the objective of the exercise from the prime minister’s point of view. Kenny says the as-yet unpublished document begins by setting out the need to rebuild trust between Greece and its creditors after a difficult six months that has seen negotiations breakdown at several points. “So I welcome the fact that agreement has been reached after an all-night session,” Kenny said. The reaction on the Irish left has been less welcoming this morning with Socialist/Anti-Austerity Alliance TDs tweeting their unhappiness at the actions of Syriza and EU leaders. @atsipras has now agreed in Brussels to #ThisIsACoup #ThisIsAColony. #Syriza in Parl should revolt. Don't sign your own death sentence. Sinn Fein leader Gerry Adams described the treatment of the Greek people as “alarming”. The conduct of a number of EU governments over the past number of weeks has been alarming. They have effectively closed down the Greek banking system and held the Greek Government and people to ransom. To its shame the Irish Government took the side of the strong against those in need of support and solidarity. It is obscene for Fine Gael, Labour and Fianna Fáil to lecture the Greek people while generations of Irish people will be paying off debts that are not of their making. The Taoiseach also said the plan to have a €50 billion Greece-based fund that will privatise and manage Greek state assets will see some of this money used for job creation. Kenny said this had been done in Ireland, where some of the money raised through privatisation of state assets was used for job creation measures. According to some of the detail of the deal that has emerged this morning, half of the €50 billion will be used to recapitalise Greek banks with the other half going towards “investments” in the Greek economy. Speaking to reporters in Dublin this morning Tánaiste Joan Burton said she was “relieved” that a deal had been reached this morning. I believe that it will offer a path for Greece to help, particularly in terms of the humanitarian crisis, building the economy in terms of investment and growth and getting people back to work. She said she would like to see “normal economic life resume as quickly as possible”. Burton also insisted that Ireland had been “extremely supportive to Greece” in the negotiations. Email “Enda glad there's a deal after a 'bruising' all-night session”. 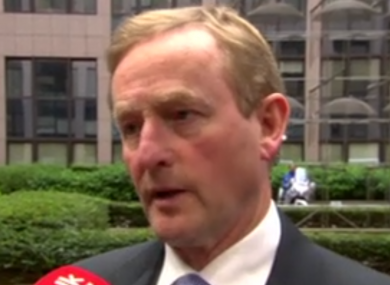 Feedback on “Enda glad there's a deal after a 'bruising' all-night session”.